Members of the European Forum on Armed Drones (EFAD) and other non-governmental organizations (NGOs) are deeply concerned by the secretive provision of assistance by European States to the United States’ (US) lethal drone operations, particularly in light of a dramatic expansion in US drone strikes and reports that President Trump has dismantled already inadequate restrictions on use of force meant to minimize civilian casualties and violations of international human rights and humanitarian law. The US has developed an extensive lethal drone programme which it uses to carry out so-called “targeted” killings around the world, including outside recognised conflict zones as part of its global counter-terrorism operations. While many US drone strikes have taken place as part of actual armed conflicts, the US has asserted the right to target and deliberately kill individuals, members of particular groups or those believed to have an association with certain groups, wherever they are, which is often outside situations of recognised armed conflict. Successive US administrations have justified such strikes either as part of a “global war” doctrine, which essentially treats the whole world as a battlefield, or on the basis of a purported right of self-defence to use lethal force across borders against individuals and groups of people who they claim pose a threat. Over the course of the past decade, NGOs, UN experts and the media have documented how potentially unlawful US drone strikes outside of armed conflict have caused significant loss of life, in some cases violating the right to life and amounting to extrajudicial executions. The failure of the US authorities to provide an adequate legal and factual justification for drone strikes, and the secrecy under which they are carried out, is a significant challenge to assessing the legality of such strikes. Transparency in this regard is critical for allowing independent scrutiny of whether States are applying the correct legal framework; without such transparency it is difficult to make a conclusive assessment of the legality of US drone strikes and of the provision of assistance by European States. Within recognised conflict zones, where international humanitarian law applies alongside human rights law, US drone strikes have also caused a significant number of civilian casualties, and in some instances appear to have violated international law, with some attacks amounting to possible war crimes. The US doesn’t conduct these operations alone: its lethal drone programme relies heavily on assistance from many other States, including some from within Europe. As Amnesty International shows in a new report, the UK, Germany and the Netherlands share intelligence, including metadata, which allows the US to locate and potentially target individuals. The UK, Germany and Italy allow the USA to use bases on their territory which also provide crucial communications and intelligence infrastructure, enabling the transmission of information between drone operators in the US and armed drones carrying out lethal strikes across the globe. 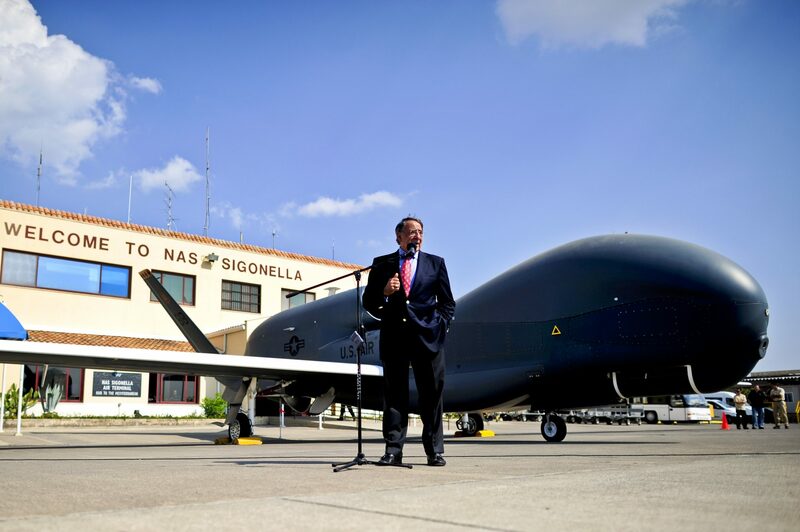 The USA is also permitted by Italy to launch armed drones from a US base in Sicily for ‘defensive’ strikes. Additionally, European industrial companies have also collaborated with US producers of armed drones in the development and manufacturing of drone-parts. Such assistance is highly secretive and is largely being provided in the absence of any public policy or oversight. By sharing intelligence information used for targeting, making airbases on their territory available, and hosting crucial communications infrastructure, European States are intricately entwined in and integral to the US’s armed drone operations. As outlined further below, they are also running the risk of violating international law. Over the past six years, as evidence has mounted of European involvement in the US drone programme, so too have concerns about the legality of such assistance, especially given questions around the accuracy and reliability of the signals intelligence being used, and the resulting high number of civilian casualties. These concerns have led to lawsuits in three different European countries – the UK, Germany and the Netherlands – as well as increasing calls for the publication of the legal frameworks and guidance underpinning such cooperation. The risk that European States are violating international law through their assistance to the US drone programme is now even more acute given recent reports that President Trump has rolled back restrictions governing the US’s use of armed drones and lethal force abroad and dramatically expanded the administration’s lethal drone operations, particularly in Yemen and Somalia where air strikes, including drones strikes, are reported to have tripled and doubled respectively in 2017. At the same time, President Trump has allowed the CIA to resume carrying out drone strikes, and threatened their use as far afield as Niger. Combined, these changes in US policy and practice mean that there is a real risk of an increase in unlawful killings and civilian casualties. Consequently, where the responsibility of other States is engaged because they have provided assistance to the US lethal drone programme in breach of international law, the legal consequences may be even more serious. And yet despite these increasing risks, there is little evidence to suggest that European States have made material changes to the way in which they assist the drone programme. The act is such that it would have been wrongful had it been committed by the assisting State itself. Consequently, where specific organs or officials of a State (such as the UK, Germany, the Netherlands or Italy) are knowingly assisting in drone strikes by the USA in violation of international law, those States may be responsible for aiding or assisting such violations. Additionally, any State that is a party to either the International Covenant on Civil and Political Rights or the European Convention on Human Rights (such as the UK, Germany, the Netherlands and Italy), may violate their own obligations under international human rights law if they assist in violations of human rights by others – such as a violation of the right to life – when they know or should have known of the violations. Any party to the Geneva Conventions should also not encourage, aid or assist in violations of international humanitarian law by parties to an armed conflict as part of their obligations under Common Article 1. European States can no longer ignore the potential legal implications of their own role in the US lethal drone programme. They must state unambiguously that they will no longer share intelligence with or provide assistance to the US where there is a risk that this intelligence or assistance could be used to carry out violations of international human rights or humanitarian law. In light of this risk, it is imperative that European States immediately establish – and disclose publicly – robust binding standards to govern the provision of all forms of assistance for lethal drone operations, implement adequate safeguards to ensure they are not assisting in violations, and launch public inquiries into existing intelligence-sharing arrangements with the USA. These calls are part of the wider Call to Action by the European Forum on Armed Drones, a civil society network of organizations working to promote human rights, respect for the rule of law, disarmament and conflict prevention. The Call to Action asks European governments to articulate clear policies, prevent complicity, ensure transparency, establish accountability and control proliferation of armed drones.